Employers in the construction industry are waiting for talented young people who are ready to work, but in order to begin, one must acquire the right experiences. Here, we map out how to get started. J. Earl Wilsey, vice president of Schmeling Construction Co., in Rockford, worked his way up from a carpentry job to the main office. There’s somewhat of Catch-22 when it comes to being employed in the construction industry. In order to start somewhere, you have to have experience. But if you want experience, you have to start somewhere. Lucky for J. Earl Wilsey, he knew a guy. One summer in high school, Wilsey’s friend invited him to help with some carpentry work. Wilsey walked away that autumn feeling accomplished and intrigued. After high school, he wanted to become an apprentice, so he could take classes through the local carpenters union while obtaining on-the-job training. He applied for a position, then waited and waited – until again, a friend hired him. It was physically demanding work, but it was fun. He enjoyed working with his hands, and math always had been his strongest subject in school. It just didn’t feel like the end goal. There was more to gain in this career. So, that’s what he did. It took another seven years for Wilsey to earn an associate degree in construction technology at Rock Valley College. 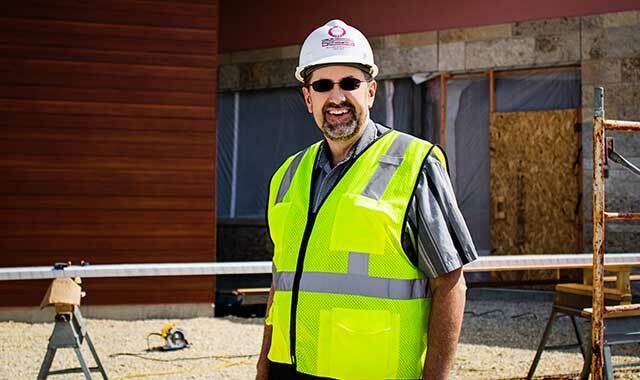 He became an estimator and project manager at family-owned Schmeling Construction, in Rockford, and today Wilsey is the company’s vice president, overseeing operations. Young people today are entering the field at a critical time. Baby boomers are retiring at an increasing rate, and such tradesmen, foremen and other leaders are departing with decades of industry knowledge. Their options for passing the torch are limited, as the market crash of 2008 sent many experienced tradesmen into early retirement or other fields. Young people with the right combination of skills and experience are finding it easier than ever to rise quickly. Wilsey says brick masons, in particular, already are feeling the pinch. But preparing the next generation has been a major challenge, for many reasons. Wilsey believes the heavily physical nature of the job, the occasional inconsistency of the work, and a lack of communication between professionals and public schools are presenting challenges. So, leaders like Wilsey are doing what they can to expose youngsters to construction as early as possible. Rockford Public Schools is doing its part, as well. Under District 205’s new Academies model, students interested in construction can explore the field through dedicated classes at Guilford and East high schools. Guilford students typically build components for Habitat for Humanity homes, then visit the jobsites for hands-on learning. Depending on the sort of work they’re interested in, students may also be encouraged to take manufacturing classes such as fabrication or machine tooling. After graduation, there are two choices: take an apprenticeship or get a college education. Trade unions are the first stop for a prospective apprentice. Each union vets applicants and matches them with local construction firms that sponsor the apprentice, who gets paid to work on the job while taking classes at the union training center, Rockford Career College and Rock Valley College. College students interested in the field most often pursue a degree in construction management. Such education prepares them to work in the office on tasks like estimating, safety management and project management. Young people on this path commonly gain construction-related job experience during their summer breaks. Groups like NIBCA – the area contractors’ association – may offer additional resources, of the financial or networking variety. Wilsey serves on the group’s education committee. Unfortunately for the Rockford area, these college grads don’t tend to return to their hometown – not right away, at least. As with any job, it’s not just your educational credentials but your “soft skills” that matter. “In construction, ‘soft skills’ means you’re good at listening, and it means you’re good at explaining something and getting everyone on the same page,” says Wilsey. Outside the classroom, there are other practical ways of gaining experience. Volunteer with Habitat for Humanity or work at a hardware store, where you’ll be exposed to practical knowledge and industry experts, Wilsey says. No matter if they’re interested in construction or another field, Wilsey encourages middle school and high school-age kids to explore as many career paths as possible. He recounts a story he once heard from a motivational speaker who also works as a magician. The speaker explained that, when he was young, he planned to work, for free, at 20 businesses to find his calling. It was when this speaker landed at a theater that things clicked. The point for young people, says Wilsey, is to get out of your comfort zone and find out early what you do and don’t like – because who wants to be stuck in an unfulfilling career? These area trade unions can provide starting points for someone interested in a construction-related job. This entry was posted on Friday, August 17th, 2018 at 11:59 am	and is filed under Northwest Business Magazine. You can follow any responses to this entry through the RSS 2.0 feed. Both comments and pings are currently closed.